The new Overwatch comic out today, “Uprising,” details the last mission that presumably led to the end of the titular paramilitary peacekeeping organization. It comes as a lead-in to the upcoming April 11 in-game event and takes place seven years before the game. In “Uprising,” we get the first look at the inner workings of Overwatch in its prime, younger versions of many playable characters, Tracer’s first foray into active duty, and the global crisis that ultimately led to the fall of Overwatch. Seven years before the game’s timeline, an omnic extremist terrorist organization called Null Sector takes over of King’s Row in London, holding the mayor and omnic peacekeeper Mondatta hostage. The English Prime Minister refuses to give Overwatch the green light to deploy, and Commander Jack Morrison, aka Soldier: 76, has to decide whether or not to disobey a direct order to protect mankind. Familiar characters like Ana and Tracer offer him counsel. Overwatch has always been notoriously light on the in-universe details surrounding what happened to its titular organization. The diverse array of playable characters are, for the most part, has-beens and heroes turned villains. The Overwatch team rose to its height in the Omnic Crisis 30 years ago, when its heroes bonded together to defend humanity from a robot uprising. But then, as Winston vaguely puts it in the game’s opening cinematic, “The people decided they were better off without us. … They tore our family apart.” Finally, “Uprising” puts things in motion to finally show us how and why that happened, and it’s clear that things go down at King’s Row that tear the team apart and utterly ruin their reputation. Spoiler Commander Morrison makes the compassionate choice, which is also likely the wrong choice. 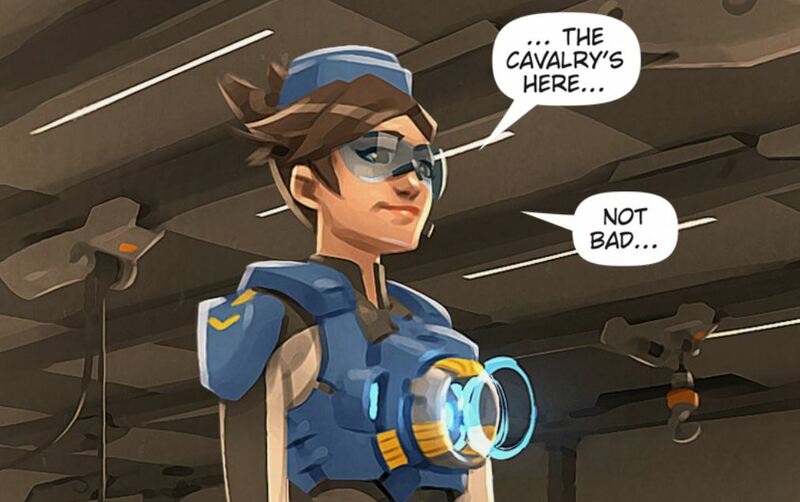 The comic ends with a squad deploying for London, and it’s Tracer’s first time on active duty. Read the comic now on the official Overwatch website, or experience the lightly animated version with sounds by Madefire. In-game, the “mission files” are slated to be declassified on Tuesday, April 11.